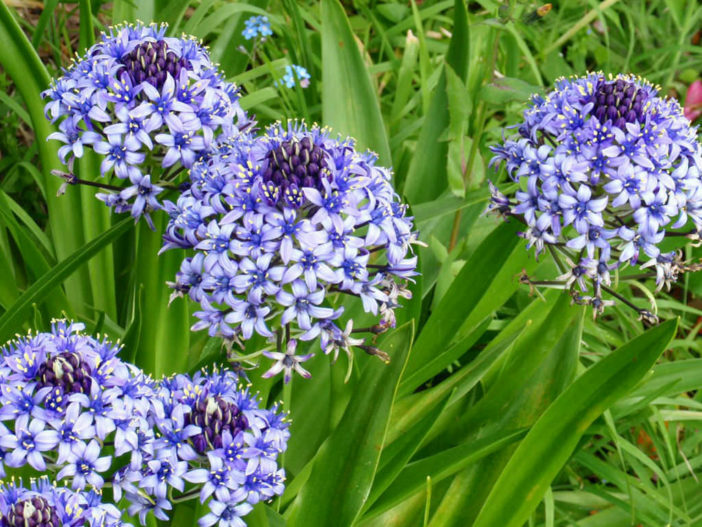 Scilla are diminutive bulbs that carpet the ground in color each spring. They are often overlooked by gardeners in favor of tulips and daffodils, but they are one of the easiest early season wildflowers to naturalize in the landscape. Scilla is one of the first plants to bloom in spring, surprising gardeners with its intense blue color well before any trees have leafed out. The foliage consists of narrow strap-like stems usually no more than a few inches tall with the flower stalks rising anywhere from four to 12 inches (30 cm) depending on the variety. It’s hardy in USDA zones 2 through 8. Bulbs should be planted in fall. Plant the bulbs in loose soil three to four inches deep and 8 inches (20 cm) apart with the tapered end pointed up. Growing Scillas from seed is easy, but takes a few years to get into flower. Sow harvested seed as soon as ripe – place in cold frame or cold greenhouse. Too much heat will delay germination of Scilla seeds. They will show through in around 6-8 weeks. Digging up and then division of the bulbs after – take off the offsets – in autumn is the quicker way to amass another belt of vivid blue. Plant in their flowering positions, but expect to wait a further year before any flowers of consequence are seen.